So now that baby boy is over 3 months old, I have been happily enjoying a few cocktails of the season - wine spritzer, sangria, mojito - but I have just discovered my new favourite! Playing around with the tropical flavours of pineapple, coconut, and rum this light and refreshing cocktail is a twist on a Pina Colada, without the calories. You could easily turn it into a mocktail without the rum and it's just as tasty. I am also excited to show off my new moscow mule mugs. What I love about these is that they're hand-made from 100% pure food-safe copper and the interior is lined with high-grade nickel. Copper is a heavy metal that reacts with acidic fluids which may cause you to ingest too much copper. 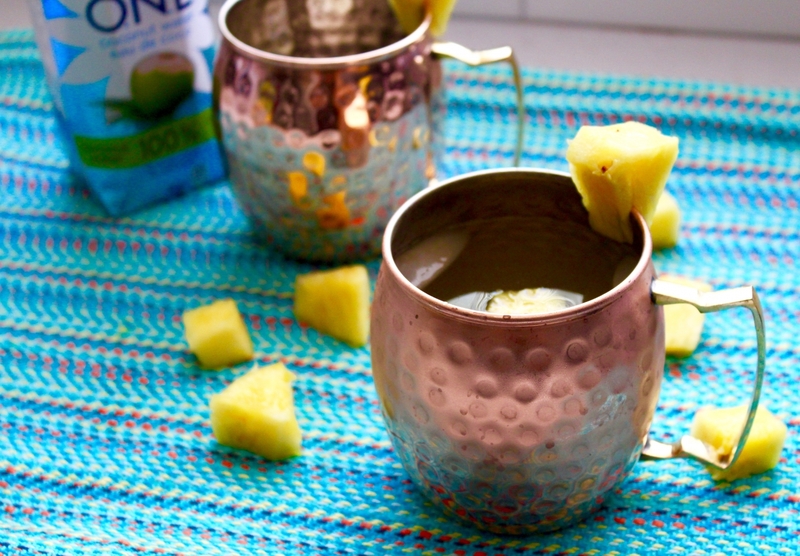 These are super trendy right now and they make a perfect (and safe) cocktail mug.